Make it a Black & White Christmas with Festive Fives and Half Season Tickets! 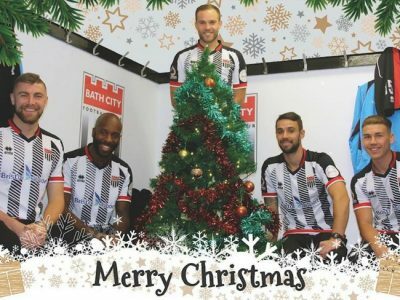 Save up to £30 on entry to Bath City games for the rest of the season with one of our special Christmas bundles – treat yourself or a loved one! Ticket bundles available in store, by phone (01225 423087 in office hours) or online. FESTIVE FIVES: A Bath City FC Festive Five makes the perfect Christmas gift. It’s five tickets for the price of four – complete with a free Christmas card (while stocks last). Tickets may be used by one person over five separate games of their choosing, or share among friends and family for a special day out. With the big home New Year’s Day match against Chippenham as well as Torquay on 19th January to look forward to and seven possible promotion and play-off places to target in the new year, this’ll be a great Christmas gift. HALF SEASON TICKETS: Back the Romans all the way to the end of the season with a Half Season Ticket and save up to £30. City are playing an expansive style of football and knocking on the door of promotion in front of some big crowds this season. So make sure you’re backing the team every kick of the way as they chase down those all-important top seven play-off and promotion places. With the big home New Year’s Day match against Chippenham to look forward to, you won’t have to wait long to wait to put your Christmas treat to use. PLUS – get a bonus free drink voucher with each half season ticket.